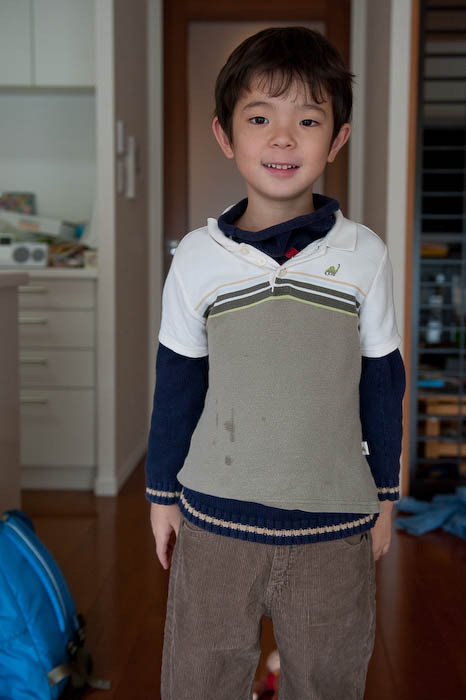 It was pretty chilly this morning, so while Fumie made Anthony's bento, I laid out some warm clothes for him. This included a sort of small shirt and a big fluffy sweater. I'd intended that he wear the big sweater over the small shirt, but he had other ideas. I’m not sure if he’s a fashion visionary starting a hot new trend, or a miniature engineer who followed the exact letter – if not the intent – of your instructions (“put these clothes on”). Or maybe he’s just 6. In any case: cute!